Congratulations to "Christine B. ", the winner in Jacki's giveaway. Thank you to all who participated! It’s impossible to calculate how many hours I spent with my characters when I’m writing a book, but I’m sure it’s in the hundreds. When you write a series, that means you spend even more time with those characters until they become almost like real people. Readers get emotionally attached to characters as well. How often have you wished that an author would write another book so you could revisit your favorite heroes and heroines and find out what is happening in their lives now? That’s why I wrote A Marine’s Christmas Wedding. 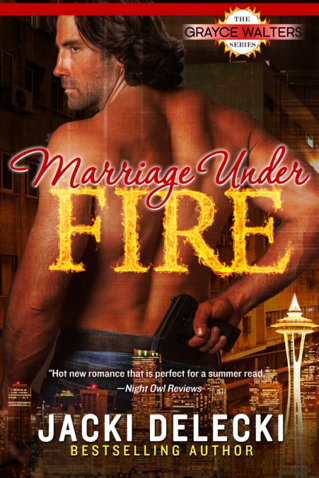 I introduced readers to Maddy Jeffers and Hunter Hines in Marriage Under Fire (Grayce Walters Contemporary Romantic Suspense, Book 4). In that story, Marines Maddy and Hunter are given an undercover assignment to infiltrate a Seattle terrorist cell that requires them to pose as a married couple. Although their roles were make-believe, the love and passion that developed between them was very real. Marriage Under Fire ends with a proposal…but no wedding. And everyone knows the only thing better than a wedding is the honeymoon. Of course there have to be a few complications on the way to the altar. In A Marine’s Christmas Wedding, those complications come in the form of well-meaning but over-attentive friends and uncertainty about Maddy and Hunter’s next assignment, which could separate the newlyweds. I loved writing Maddy and Hunter’s story and admit to sniffling a few times when I wrote the wedding scene. It was heartwarming to see these two deserving people get their Happy Ever After…even if they are fictional characters. I’d love to share this holiday romance with a few readers. For a chance to win a digital copy, just comment with a character, couple or series that you’d love to revisit. I hope your holidays are filled with books, romance, friendship and love! Keep reading for a short excerpt from A Marine’s Christmas Wedding. Their pretend marriage—cover for a top-secret military assignment—turned into something real. Family. She shifted on the couch, not knowing where to look or what to say. Her only family was her fellow Marines. “I didn’t think you’d want to…” Maddy struggled to find words but was given a reprieve by the chiming of the doorbell. The caterer opened the door for Aunt Aideen. Maddy was grateful for the interruption and hoped it would be the end of the wedding discussion. “We just started discussing Maddy and Hunter’s wedding plans,” James said. Maddy found herself sliding down on the couch. Like a darn Marine sergeant with new recruits, James wouldn’t give up until he’d shaped up everyone. A Marine’s Christmas Wedding is just 99¢ at your favorite online retailer. Giveaway ends 11:59pm EST December 14th. Please supply your email in the post. You may use spaces or full text for security. (ex. jsmith at gmail dot com) If you do not wish to supply your email, or have trouble posting, please email maureen@justromanticsuspense.com with a subject title of JRS GIVEAWAY to be entered in the current giveaway. Cat and Bones from the Night Huntress series. I would like to reread the first books in Elizabeth Hoyt's MAIDEN LANE SERIES. I still have a few of the later ones to catch up on.